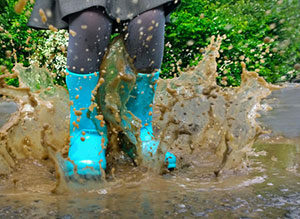 Does your yard turn into a mud pit after it rains? The kids and the dog might love it, but it’s a nuisance for the rest of us—particularly if you have a lot of beige carpets inside the house! We’ve all had that moment where a child or a pet appears dripping in mud, and walks it through the entire house. Those muddy footprints can be a real pain to clean. Not only this, but a muddy yard can be dangerous too. You could easily fall and strain a muscle if your foot slides in the wrong direction. Thus, it makes sense for homeowners to want to find ways to improve the drainage on their property. It wouldn’t matter so much if it was far away from the house, but when there are puddles right outside the front door something needs to be done. The simplest and cheapest way of improving the drainage in your yard is to increase the amount of air in the soil. You can do this by poking a pitchfork evenly throughout the area. This will improve things for a while, but do you really want to spend every weekend going around and poking holes in your yard? This is only viable for the short term. Spreading mulch over the areas that tend to gather water will help to reduce the excess. Mulch absorbs the water from the soil, resulting in improved drainage. This is another temporary solution that isn’t feasible long term because mulch is an organic material that decomposes over time. Grading your yard with fill dirt involves using stakes to establish the gradient of your yard. You don’t want it to be entirely flat because drainage will get even worse. Every home needs a slight slope to encourage water flow away from the house. Using the stakes means you can see which parts need to be raised with fill dirt, and which parts need to be dug up. The process of moving dirt from a place with too much to a place with not enough is known as ‘cut and fill’. It might take a bit more time to do things this way, but it will save you money. Grading is best done by a professional, although some people attempt to do it themselves. At the end of the day, an industry expert will have better equipment and more experience, resulting in a more accurate gradient. Calculating the weight of dirt you need for your landscaping project can be accomplished by measuring the area that needs filled with dirt and then converting these measurements in accordance with the units of dirt you buy. Topsoil, for example, usually comes in cubic yards. You should never use topsoil for a heavy duty project, however. Fill dirt is the type of dirt that will help you solve your excessive water problem. A common query about dirt is how much it costs. For example, you might ask yourself ‘how much is a truckload of dirt?‘ Well, that depends on the size of the truck! Thankfully, there is a more reliable way of calculating the cost of dirt. The first step is determining the amount of dirt you need for your project. You measure the area that needs to be filled (taking into account all of the dimensions), and then find out what volume the dirt can be ordered in. Dirt is measured in cubic feet and cubic yards, so make sure you convert your initial area calculation to cater for this. Depending on where you live you might even be able to get some free dirt! Grading is the only really permanent solution for excessive runoff water. The other solutions provided are only temporary measures. If you want to never worry about a muddy yard again, grading is your best option. When hiring grading professionals, it’s important to choose the right team. Here at Dirt Connections we have over thirty years of experience serving customers in the Virginia, Maryland, and Washington DC areas. We provide services that range from real estate purchasing to long distance relocation services. 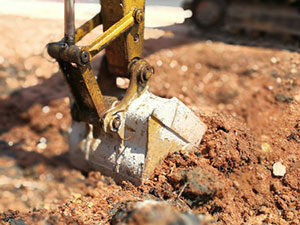 We are confident that you will approve of our commercial dirt grading and site work.